This camber kit allow a wide range of camber adjustment and enable you to positively lock the lower control arm in position. 65-66 cars in stock form had no adjustment on the lower control arm leaving all camber adjustments down to shortening the upper arm by removing shims. You can only take out so many shims and then you are stuck with whatever maximum negative camber figure you get! With this kit, 65-66 car owners can now move the lower control arm 3/8" inboard or 3/8" outboard from stock for a more precise and wider range of alignment settings . Square tabs positively lock the settings in place and eliminate any slipping or movement. Welding & possibly some grinding required for installation. The kit has everything as shown and are nicely manufactured. I hope to experiment with all of the options possible soon! These can be installed with the car on jackstands, but I would advise getting it up as high as you feel comfortable. If using a die grinder make sure you can use both hands in it, carbide bur bits can really bite and remove a lot of material quickly, be careful not to bind whatever bit you're using in the original hole when trying to oblong it. Clean everything up to bright shiny metal prior to working and welding. Take your time and it will come out fine. If you're having a hard time trying to figure the level, try establishing level between the frame rail and top of the retainers 'ears'. The relation between the retainers and the lower arm mount's pressed sheetmetal flange will possibly be different for each retainer you install. Some might require notching just the inboard corner of the flange, the lower flange completely, or some combination. Do not cut the retainers, and make sure they sit flat. 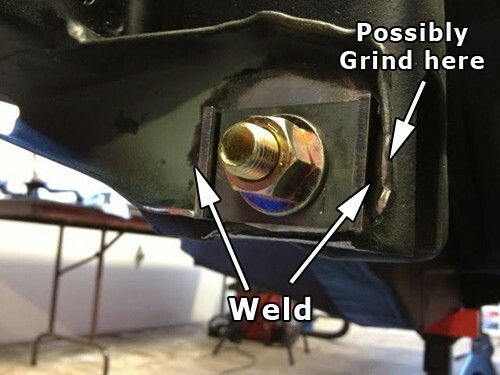 When the retainers are welded to the car, make sure there are no spatters, blobs, etc obstructing the seating surfaces. 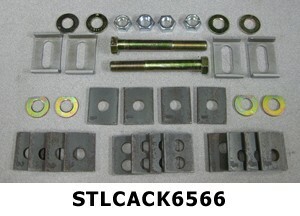 And, make sure you have free movement using the sets of plates and the bolt at the extremes of the adjustment range. Great instructions. Installation went exactly as expected. I did it in my garage on jack stands which wasn't too bad, but be prepared to get showered in metal shavings and weld splatter. The hardest part was grinding out the holes. A good carbide burr on a die grinder is crucial. By inserting the burr deep enough you can make sure you only remove material from the car, and not the plate retainer. Align the burr so the carbide hits the chassis, but only the shank of the burr hits the retainer. You don't want to accidently widen the slot in the plate retainer. Now back to the track!